I was thinking of slowly placing her beside me on the bed because I wanted to get up and do some household stuff while she was asleep. But then I paused. I'm sure a few years from now (which I'm pretty sure will arrive before I know it) when Rain grows into a kid ... eventually into early teen... when she can't be bothered with her extracurricular activities or checking her social sites (whatever replaces Facebook or Twitter ) or whatever teens do in her time... when she is too big to sleep on my chest or even cuddle with me in bed... I know I will look back to this moment and regret putting her down on the bed so quickly. So I let her sleep on top of me until she started squirming and seemed to want to lay on her back. Sooooooo sweet! Happy birthday Rina! God bless you and your family even more! Wishing you great health and more blessings. Happy birthday and belated happy mother's day to you. God bless you and your family. Awww! Sweet! Yes, they do grow up so fast! I have my own sweet not-so-little girl (7 years old agad!) I find myself watching her sleep before dozing off. One thing is for sure, once your baby-always your baby. On this special day, I wish you all the very best, all the joy you can ever have and may you be blessed abundantly today, tomorrow and the days to come! May you have a fantastic birthday and many more to come... Happy, happy birthday, Rina! Aaawww...I can feel you Rina. I have a 14-month old son and I embrace & kiss him as much as I can. Kids grow up so fast. When they've grown, we can't kiss and hug them as much as we like anymore. Happy birthday Rina. God bless! so sweet.. i know the feeling cause my daughter is doing the same to me :) your daughter is so adorable :) im wishing you good health, success and happiness! may God bless you always and your family! I can relate to this Mommy Rina.. Kids nowadays grow up so fast! I am grateful upon seeing my kids' baby photos and comparing to how they are now. Parang matatanda kung umasta. Nakakaloka! Hehe. Have a blessed birthday Ms. Rina! I also just had this kind of "mommy moment" with my daughter. Well not exactly the same but you know those heartwarming moments with your child. She awoken from her sleep and didn't see me beside her. She stood up and walked towards me even though she was staggering. So I laid beside her, placed her around my arms. Before I knew it she was back to sleep, with a smile on her face, Priceless. I super feel the same. At times, I even tell her to grow slowly cause every time I look at her she seems bigger than how she looked a day before. You're right Ms. Rina, being a mother makes a person soft. Hi Ms. Rina! Happy birthday! I can see that you're a great mom & you deserve all the blessings that you have. Happy Birthday, Rina!!! I am a fan of your husband-and-wife tandem, and Rain is just sooooo cute! Happy birthday and more blessings to come to you and your family. I am amazed at how well you have managed your own, your husband's and your children's lives all at once. You should be given an award! For the time being, accept this recognition from me and let's raise a toast on the Birthday for being the most special person in our lives. Wishing you a very Happy Birthday. Happy Birthday Ms. Rina!More blessings and happiness with the Pickiest Eater and your Little Rainbow...and of course more power to your blog coz I really love to read your posts. Same sentiments here, Rina! That's why I try to be "more present" whenever I don't have work and I stay home with my son. Time sure flies by and like you said, before you know it, our young ones have turned into adults. May you have a wonderful birthday with your super cute Rain and your equally cute husband! GOd bless you! 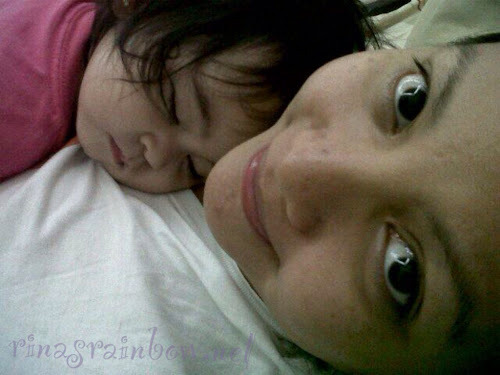 Ganyan din yung daughter ko when she's still a baby.. she loves sleeping on my chest (kahit mabuto! haha!) But now (she's 2 na), kahit minsan nilalagay ko sya sa chest ko.. ayaw na nya :( pero may mga times na ganon pa rin pero saglit lang siya nagstay sken, and mabigat na rin! hehehe!